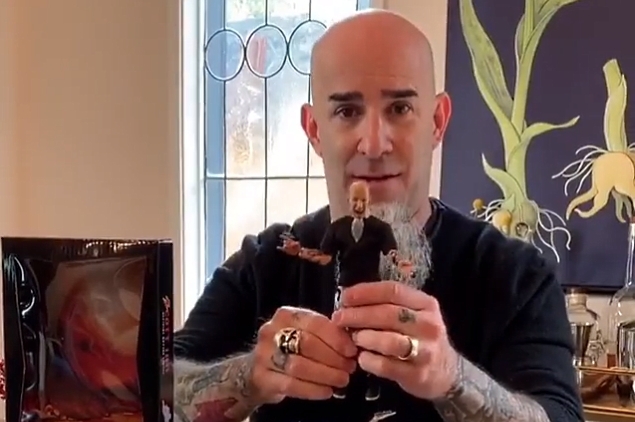 An eight-inch action figure of ANTHRAX guitarist Scott Ian has just been made available from NECA (National Entertainment Collectibles Association). A short video clip of Scott unveiling the action figure can be seen below. Scott previously said that the figure would include his "infamous 'Walking Dead' appearance" zombie head. "Paying close attention to detail recreating my tattoos and overall look, the wizards at NECA nailed it," he said. "This awesome fully poseable action figure comes with an extremely accurate tiny version of my signature Jackson Guitars King V."
Order yours now at this location. NECA is a leading creator, marketer, and global distributor of licensed consumer products based on some of the world's most recognizable movies, video games, comic books, and pop culture. The NECA group of companies includes game developer and publisher WizKids and urban vinyl icon Kidrobot.